Screengrab of Reinvesting in Arts Education. Last week I blogged a about the glut of new information that’s becoming available to arts advocates. One of the reports, Reinvesting in Art Education by the President’s Committee on the Arts and Humanities, has already made a relatively big splash since its release this past Friday. The report made headlines in the LA Times, the Washington Post, the Wall Street Journal, and EdWeek—all mainstream publications that are not necessarily preaching to the arts advocacy choir. These articles point out one of the report’s main tenets, and one that is familiar to art educators and advocates—while there are myriad reasons art education helps build stronger schools and students, art ed programs and funding have continued to decline. The report itself is hefty, weighing in at nearly eighty pages, and includes an introduction by Secretary of Education Arne Duncan—an important vote of confidence from the most visible education administrator in the country. “To succeed today and in the future, America’s children will need to be inventive, resourceful, and imaginative. The best way to foster that creativity is through arts education,” Duncan writes. Reinvesting culminates with five recommendations for improving and expanding art education in American schools: 1. Build collaborations among different approaches to art education; 2. Develop the field of arts integration; 3. Expand in-school opportunities for teaching artists; 4. Utilize federal and state policies to reinforce the place of arts in K-12 education; and 5. Widen the focus of evidence gathering about arts education. These recommendations are based on an agglomeration of prior data that the report outlines, comparing data on the benefits of art education as well as challenges the education system is currently facing. Art education’s strengths (it’s an indicator of student achievement and engagement across economic levels!) are then matched to the wider challenges (distressingly high dropout rates, students with inadequate skill sets). Recommendations also take the budget picture into account by suggesting how to implement these recommendations in the most efficient way—an important point, as another takeaway from the study is that students in underserved schools have the most to gain from a strong art education. 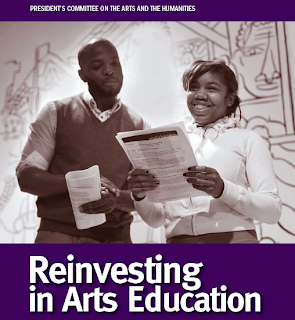 You can download Reinvesting in Art Education here. I’d love to hear some input from art educators on the report—from what you see in your schools, does it hit the most relevant points?